• Zinnor ANYWHERE, ANYTIME: Let it Snow instant snow powder for slime is the premium brand of fake snow powder that looks and feels like real snow. So much FUN for all ages! • CLOUD SLIME: Let it Snow artificial snow powder is the best instant snow for CLOUD SLIME and JELLY SLIME on the market! Your kids will love this educational toy that is great for science based activities. • WINTER WONDERLAND: Looks and feels like real snow! Perfect for snow party decorations, Frozen theme birthday parties, winter snow photography, Christmas decorations, and of course cloud slime! • EASY TO USE: Just add water and watch it erupt into snow in seconds! No stirring or mixing is required. Easy to follow instructions are included. Watch as your artificial snow mix grows 100 times its size! Simply add water and watch the magic begin. Mix with adult supervision. • SAFE and NON-TOXIC: Zinnor fake snow for slime is a safe and non-toxic super absorbent polymer developed specifically to imitate most of the properties of snow. KIDS LOVE IT! • YEAR ROUND USE: This artificial snow can be used year-round for snow play, holiday displays, special events, party favors, floral arrangements and more. Your choice. It can last for many days or weeks and is reusable. • ECO-FRIENDLY, NON-TOXIC: It is a safe and non-toxic super absorbent polymer developed specifically to imitate most of the properties of snow. • RECOMMENDED USES: Slime, Party favors, inside of the piñata, science projects, Christmas envelope stuffer, stocking stuffers, experiments and more. They make awesome gifts for kids, adults, teachers, and those who never get to play in the snow. Sprinkle on the trees, mantle, around the nativity. Use it to add radiance to a photo shoot and on a banquet table to add to the decor. The uses are endless! If you can imagine it - you can use it! 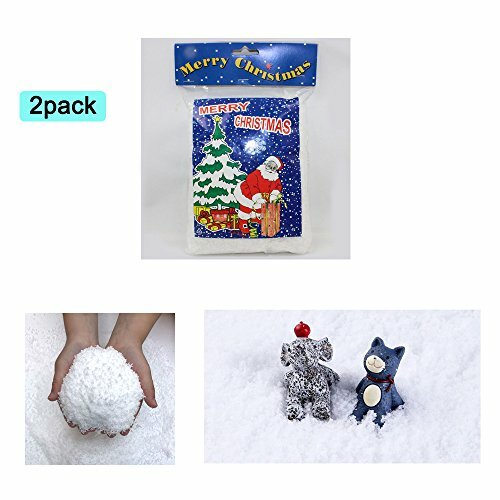 ✅ LOOKS REAL：This is an extremely realistic artificial snow that can be used for parties, displays, holidays, hobbies, and all kinds of indoor/outdoor fun. (see Mixing instructions for outdoor use limitations). ✅ EASY TO USE：Just add water and watch it erupt into snow in seconds! No stirring or mixing is required. Easy to follow instructions are included. Watch as your artificial snow mix grows 100 times its size! Simply add water and watch the magic begin. Mix with adult supervision. ✅ SAFE and NON-TOXIC：Zinnor fake snow for slime is a safe and non-toxic super absorbent polymer developed specifically to imitate most of the properties of snow. KIDS LOVE IT! ✅ LAST LONG TIME：It will stay fluffy for days! It can be used anywhere, indoor and outdoor. If it dries out just spray water and it will puff right up! YEAR ROUND USE：This artificial snow can be used year-round for snow play, holiday displays, special events, party favors, floral arrangements and more. Your choice. It can last for many days or weeks and is reusable. ✅ RECOMMENDED APPLICATIONS：Slime, Party favors, inside of the piñata, science projects, Christmas envelope stuffer, stocking stuffers, experiments and more. They make awesome gifts for kids, adults, teachers, and those who never get to play in the snow. Sprinkle on the trees, mantle, around the nativity. Use it to add radiance to a photo shoot and on a banquet table to add to the decor. The uses are endless! If you can imagine it - you can use it! If you have any questions about this product by Zinnor, contact us by completing and submitting the form below. If you are looking for a specif part number, please include it with your message.